We spent over 33 hours researching and testing more than 25 different kinds of bass guitars and found that intonation, features, and design were most important. The Squier by Fender Special Jaguar Bass scored high marks in all areas and is our top pick. The great looking and great sounding bass guitar is a beautiful candy apple red and has an ultra slim 30″ scale neck and a split single coil that is booming. It provides exceptional tone, comfort, and smooth playability. You’ll be able to control the volume and tone with the Master knob and 2 volume controls. Bass guitars are very versatile instruments and can be used to play all different kinds of music. When you decide you want to purchase a bass guitar you want to understand bass guitar terminology and also the components of the bass guitar itself. There are many good, reasonably priced choices on the market that work well for beginners and experienced players alike. If you have never picked up a bass before, you may be okay with one of the starter kits. Many people believe that even if you ARE a beginner, that investing in a quality bass guitar from the beginning will make a difference in how fast you learn and how you feel about playing. A higher quality bass guitar will feel better, sound better and last much longer. Choose the Bass Guitar that puts classic Fender looks into a great-sounding, super flexible Squier bass model. Some of the features that this Candy apple red Special Jaguar Bass has includes a sleek, off-set waist body, ultra-slim 30” scale neck, and a booming split single-coil Precision Bass middle pickup. This is combined with a Jazz Bass single-coil bridge pickup. This bass guitar is the perfect choice for those who want the comfort of a short-scale instrument. It provides superior tone, smooth playability and comfort all at a terrific value. The design of the neck is a convenient C-shape and made from maple, one of the most popular materials for guitar necks. It has 20 jumbo frets and a 9.5” radius. Control the volume and tone with a Master tone knob and 2 volume controls. The two pickups allow versatility that a new or seasoned player will enjoy. This eye-catching neon green bass guitar is for the player that wants to stand out. The lightweight basswood body and maple neck and fingerboard combine shocking color with excellent performance. The black block markers contrast with the bright neon green of the body and matching neck. Other features include split pickups, 20 frets and black hardware. The bolt-on construction and split pickup add to the high quality and great sound that this bass can produce. The sealed, diecast tuners ensure that the bass stays tuned. Whether you are a very new beginner that wants to start learning in style, or a seasoned player looking for a terrific and flashy bass as a second instrument, this Dean Custom Zone Bass in Nuclear Green fits. The basswood construction of the Dean Edge is topped off with finished mahogany, creating a beautiful bass guitar that any player will be proud to own and play. The body of the Dean Edge is contoured for maximum comfort and styled for sleek appeal. Because of the basswood construction, this is a lighter weight bass. The Edge 09M has a speedy maple neck with a rosewood fingerboard and beautiful abalone dot inlays. The 22 frets are easily accessible so you can play high notes with ease, due to the deep cutaway and Dean’s custom joint/heel. The soapbar passive pickup provides smooth, low-end and aggressive high-end with tons of response and tone control. Whatever musical style you have, this Dean Edge Bass guitar will shine. Diecast tuners by Dean ensure that the bass guitar stays in tune. The vintage style bridge allows everything to be set up perfectly on the intonation front. The Dean-design neck joint and heel, combined with an asymmetrical 4 bolt pattern allows for uninterrupted movement up and down the 22-fret neck. The satin finish features black hardware and a mahogany body. This affordable and stylish bass not only looks good, it plays good as well. Choosing the perfect bass guitar can feel like a daunting task if you are new to playing. Even if you’re not new to playing the bass, you don’t want to spend money on an instrument that is substandard and that you will just want to replace. 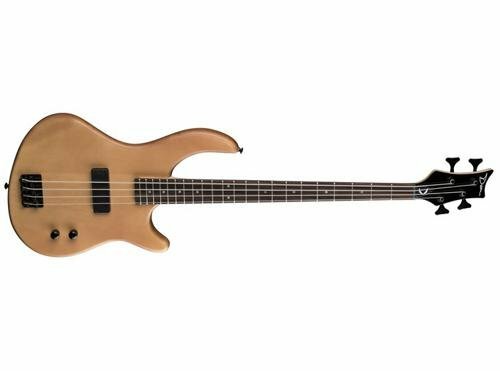 We considered 15 of the most popular bass guitars on the market in the areas of construction, design, versatility, features, weight, intonation, sound and more. These three choices featured here were the clear winners in all these categories. Customers love them and it is easy to see why. Our detailed reviews give you even more information about each one so you can see which one of them appeals to you the most. Will it be the Epiphone Cherry Red Bass with its 30” slim neck, perfect for beginners, or the Dean Edge with the unique mahogany body and beautiful tone, or the shockingly neon green Dean Custom Zone with black hardware? Whichever one you choose, when you take the time to research them and compare that to your needs, you will end up with a terrific instrument that you will love playing for years to come. There are a few things you will want to consider before you start searching for your first or next bass guitar. Size and Age of the Player – You want to find the bass guitar that is a great physical fit for the player. Since bass guitars come in all shapes, sizes and weights, this will not be too difficult if you check a few things before you buy one. Younger, smaller players will have better results from a bass guitar that has a thin neck, short scale and lighter weight. Tall, large players will enjoy the feel of a heavier bass with a longer scale and wider neck. What Type of Music Will You Play? – There are so many different genres of music, but normally when someone buys a musical instrument such as a bass guitar, they already have an idea of the type of music they are interested in playing most often. Pay attention to the types of basses your favorite players play. More than likely you will find the different types of basses due to the type of music that they play. That will give you some guidance as to the kind of bass you may want to choose as well. If this is your first time ever buying a bass guitar, we have listed some guidelines that you may want to apply. These guidelines can help you purchase the perfect bass guitar for your needs and preferences. Choose a bass with frets to learn on. Later on when you have much more experience, you can try the fretless variety. If your hands are small or you are purchasing a bass for a child or young person with small hands, choose a short-scale bass. 4 stringed bass guitars are easier to play and learn on as well. Choose an instrument with simple controls so the focus is on the strings and not the myriad of controls to mess with. Choose a bass you love the color and shape of. Purchasing a bass that really appeals to you. It will motivate you to play and practice. There are two basic styles of body when it comes to the bass guitar although there is no industry standard overall. These two more common design styles are: solid body and hollow-body. Solid Body – The solid body guitar is made of a solid piece of wood. This wood can be maple, mahogany, alder or swamp ash. There are cheaper varieties that can be made of plywood, pressed wood or plastic but you really want to avoid these. You will need an amplifier to play a solid body bass guitar. All types of music can be played on a solid body instrument. Hollow Body – Hollow body bass guitars tend to be most often used to play jazz and folk music. This type of bass is the acoustic equivalent of bass guitars. They are lighter than their solid body counterparts but they can only produce so much volume. Electric acoustic bass guitars require pickups that allow the bass to be amplified. The pickup is a magnet that is located under the strings. The purpose of these magnets is to transmit sound to the amplifier. There are two different types of pickups that you will find on a bass guitar. Single-Coil – This is the first pickup that was put onto a bass guitar and produces a clear, bright sound. Single-coil pickups are susceptible to interference. Humbucker – The humbucker pickup is much less susceptible to interference. They don’t have the clean sound that single-coils do. Where the pickup is located on the guitar has an impact on the sound the bass guitar produces. If they are closer to the bridge, you will notice more treble and mid-tone sounds. If it is closer to the fretboard, you will get bassier sounds. The neck of a bass guitar is where the fingerboard or fretboard is located. They have metal frets on them and indicate where you should put your fingers to play different sounding notes. Bass guitars are not typically strummed the way an acoustic or electric guitar is, they are plucked. The majority of bass guitars have fretboards but there are some that are fretless. We have listed some of the differences between a bass with a fretboard and one without. Basses with Fretboards – If you are a beginner, you will want to start with a bass that has a fretboard. The frets allow the new player to know where to place their fingers to produce certain notes. Basses without Fretboards – Fretless bass guitars produce a smooth sound that is very fluid in tone. This is due in part to the fact that there are no frets to stop the fingers from sliding from note to note. The player needs to rely on their ability to recognize the correct notes so it is highly recommended that only experienced players play a fretless bass. The bass guitars that are typically in starter packages are not going to be as high quality as ones you find on your own. If you are not sure whether you want to pursue playing the bass guitar, a starter package might be a better investment. It will have everything you need to play the bass and see if it is something you want to continue. It doesn’t matter whether you are purchasing a base for the very first time and have never picked one up at all, or you are an experienced bass guitar player looking to add to your guitar collection, finding the right one is going to take time and research. We’ve made this process much easier by reviewing the top three bass guitars on the market and also by giving you a detailed buyer’s guide that gives you the information you will need when you start looking at bass guitars. No one bass is going to be perfect for every person. The needs and preferences will vary from person to person depending on age, size, experience level, color preference, style preference, music genre, sound production, brand desired and more.